After meagre pickings from my attempts at growing dahlias in the past I now have several plants with numerous buds or flowers, a thrilling position to be in. These ‘Karma Serena’ were the first to bloom and have been crying out to be used in a vase for at least a fortnight and today their time has come. The dahlia was grown from a tuber from Peter Nyssen (described as white with a greenish yellow centre), potted up in the greenhouse on arrival and then planted out when there was a reasonable amount of leaf and shoot showing, perhaps sometime in May. In future it might be helpful to add this to my record keeping chart along with details of seeds and sowing. I had no doubts about sticking to a white and green palette for the vase contents and quickly snipped some Amaranthus ‘Green Cascade’ and immature Ammi visnaga heads. The dahlias had fairly lengthy stems but to allow the amazing green tassels of amaranthus to dangle to their full advantage the tall black vase I had bought at a car boot sale yesterday was pressed into service – but turned out to be too tall for the dahlias. Filling the base with glass pebbles quickly solved this and a slight rearrangement of the blooms produced a stylish vase in very little time. 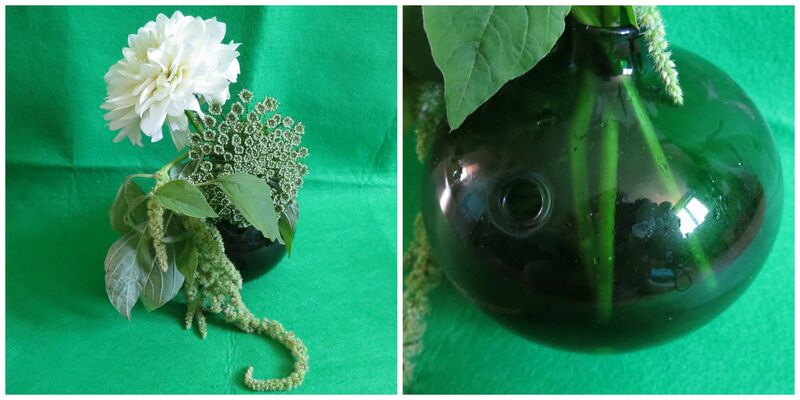 The second stem of amaranthus and the ammi flowerhead would have been superfluous so were trimmed shorter and placed in one of the two Holmegaard vases I acquired recently, lovely examples of Danish studio glass designed by Michael Bing. I love the tactile form of these vases which have several holes over the curved body as well as the central hole, but in practice they are not very practical as unless stems are wedged into the surrounding holes they would not stand up – not to mention the fact that the vases can’t hold much water because of these holes! This is the smaller of the pair, and I am pleased to have finally been able to use it! What will you find in your garden to put in a vase today? Will it be calm and serene, or bright and bold? Multicoloured or monochromatic? Do share it with us by leaving links to and from your post – and enjoy the pleasure that comes with the choosing, the making and the observation of your vase over the next few days. My calm and serene vases were photographed against a background of green felt, although more of a lime green than the ‘mint’ green the photographs suggest. 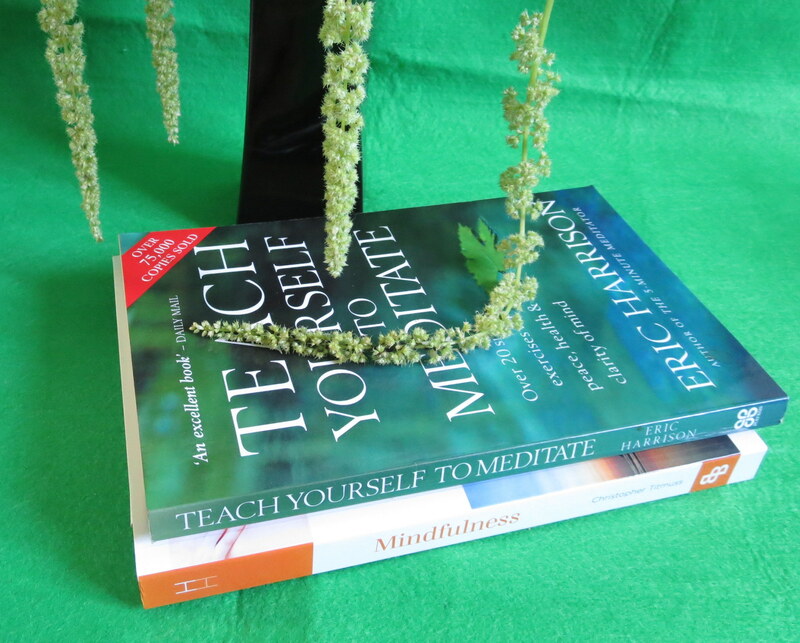 Today’s props were books on mindfulness and meditation, both practices that will bring you calmness and serenity. May all be well. May all be happy. May all be healthy. May all be free from suffering. 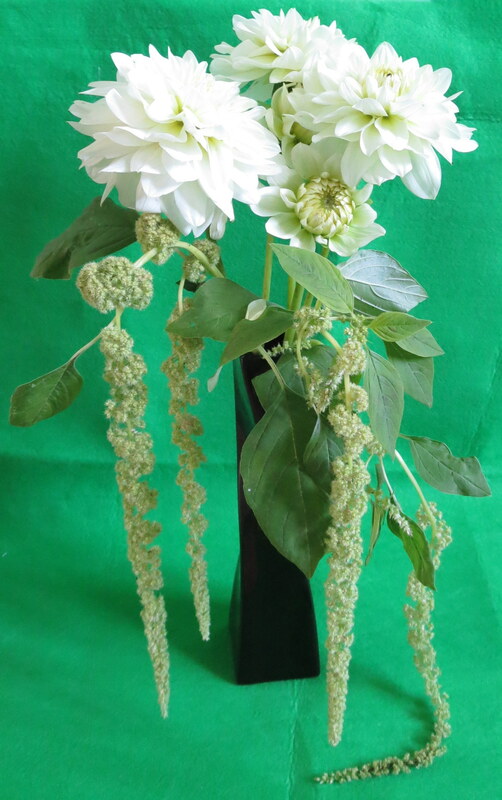 This entry was posted in Gardening, Gardens, In a Vase on Monday and tagged Amaranthus 'Green Cascade', Ammi visnaga, Dahlia 'Karma Serena', Holmegaard sudio glass, meditation, mindfulness. Bookmark the permalink. I have learnt about two new plants, I’m delighted. I have a couple of self sown plants looking like the Ammi visnaga in my gravel patch, it’s good to get to know a possible name for them. And the elegance of the Amaranthus is very tempting, must look out for that one. Sadly I’m still feeling too under the weather to take part this week 😦 but it is going to cheer me up immensely to see all the other contributors who pop in to your place with their vases! Oh I am so sorry you are still not well – it has really knocked you about, hasn’t it? I shall send you healing energies to help in your recovery. I prefer the A visnaga to the more usually grown A majus – it’s chunkier but great visually through all stages of flower development and the dried seedheads look good too. I love your green themed arrangements, very elegant. How hard is the green amaranth us to grow? Also … It looks like it might just dry well … Does it? Thanks for the helpful cultivation details, I encouraged to try them. I agree, the green is really striking. Excellent, I’ll be trying some next year; where did the seed come from, anywhere special? A very calm and serene vase, all three flowers complement each other with their different shapes. I will put the dahlia on my wish list for next year. As successful dahlias are so new to me I am just amazed at how well they look good for so long on the plant too – I get a real thrill seeing them! I love this Cathy, definitely one of my favourite s of your vases. I especially like the Amaranthus ‘Green Cascade’ ; that’s something I thought about buying last year but decided I had too many things already but seeing yours I think I made a mistake its fabulous. Here’s my link:https://myhesperidesgarden.wordpress.com/2015/07/20/in-a-vase-on-monday-dahlia-joy/ Thanks for hosting. Thanks Christina – and it was so easy to do too although I don’t think I could fail with these blooms though! Mind you, they slurped up the water in no time and had begun to droop – I suppose I should let them stand before arranging (like it is recommended)! I love Dahlias but the Under Gardener won’t have them in the garden. He says they attract earwigs and he’s got a phobia about creepy crawlies like those and spiders..
I’ve gone hot today as that’s what was available in the garden. Thanks Susie – when we go to a car boot sale these days I always tell the Golfer I don’t intend to but any more vases, but I knew I didn’t have anything black other than a small jug so I thought it might be useful, which it was (and it was only £1)! I am really looking forward to using more dahlias! Thanks Dorris – they were a perfect combination really, weren’t they? I couldn’t go wrong! Cathy, I like your pairing of books and flowers. I meditate too and have taken mindfulness workshops, though I am not as consistent at my practice as I’d like. Being in my little garden is a meditation, too, as you well know. Thanks also for the calendar of gardening blog memes on your sidebar – I haven’t seen that before. Thanks Valorie – and I may not sit in the garden as much as I perhaps ‘should’ but I am certainly very mindful every time I walk through it or work in it. It is very much a symbiotic relationship – as I am sure the relationship you have with your garden is too. The calendar of gardening memes was started fairly recently – I first came across it on the Patient gardener, I think. Thanks Linda – and it was only after I filled the vase that the thought of using some of these books came to mind as an appropriate prop. As you say, they fitted in perfectly with the theme of the vase. Thanks Chloris – I have never heard of Itea before so I am off to look it up now… ah, a bit like Garrya…? Much nicer than Garrya. It is really elegant. Cathy these are stunning vases. The dahlia is perfection and then adding the cascading Amaranthus sent it over the top…..and I love how you curled it in the second vase. I do have to grow Amaranthus next year. A very serene vase especially with the props. Our palettes are opposite and complimentary today, Cathy! I loved seeing your arrangement, the amaranthus perfectly suits the dahlias, so cool and calm, after posting my fiery one! http://wp.me/p3O3z4-JA The little Danish vase is quite attractive and how unusual with the additional holes. Many thanks for hosting! Your stunning Monday flowers in a vase has really captured my imagination. I shall be looking into the fab green amaranthus, such a graceful compliment to the other lovely blooms you’ve chosen to present. Thanks Noelle – and I am afraid, very afraid … what have you got in yours, I wonder…? Thanks Gillian – and you are most welcome. Thanks Anna – and I am still amazed at the quantity of buds that are appearing on several of the plants! Dahlias are clearly the flower of the week! Love the restrained ‘less is more’ nature of your vases today. And the vases themselves are beautiful too. Thank you too for the note about growing amaranthus, definitely one to add to next year’s list which is growing longer every week. My contribution is a bit random, but I don’t like to leave anything out. I have to agree rickii – they didn’t need me to do anything as they just plonked themselves elegantly! Thanks Anca – and I wonder what is in your holiday vase…? Thanks Amy, and Nature produces some amazing blooms, doesn’t she? I can’t believe how long some of these tassels are! Thanks – indeed elegant, and very unlike me! That’s a really lovely vase Cathy – as you say very restful. the dahlia is beautiful. I’ve had mixed results with mine. I had some big ones overwintering in garage which were fine in previous years but no sign this year of any growth… ho hum…. I’ve been doing some mindfulness meditations recently which seem to be helping me (that and pottering in the garden). I am glad that both gardening and meditation are proving to be a support…. Re dahlias – I had very little success with Sarah Raven tubers last year but my new ones from Peter Nyssen are all doing well this year – could have been the result of the rubbish compost I used early last year rather than the tubers though. Welcome Sam – blogging can add a whole new dimension to Life. It has been a huge pleasure to make contact with other garden bloggers – so friendly, supportive and knowledgeable. And of course it is a great way of keeping a record of the garden, which is the main reason I started it, but it also makes you far more observant of it. Really nice textures in the vase with the Ammi and Amaranthus (with a cute curl of the tail). Thanks – the dangly amaranthus flowers are so intriguing, aren’t they? Simply beautiful 😉 congratulations on the lovely Dahlias and spectacular Amaranthus. Thanks – they were very obliging subjects!